"This is a great way to use sweet potatoes and other staples you have laying around. Cooking for a Crohn's husband, we're always trying to find ways to cook vegetables down so he can still enjoy them. If necessary, thin with additional milk. Serve hot with a sprinkling of pepitas, if desired." Combine milk, sweet potatoes, apples, onion, carrots, celery, garlic, salt, nutmeg, cayenne pepper, and peppercorns in a large pot; bring to a boil. Reduce heat to low, cover pot, and simmer, stirring occasionally, until potatoes are soft, 20 to 30 minutes. 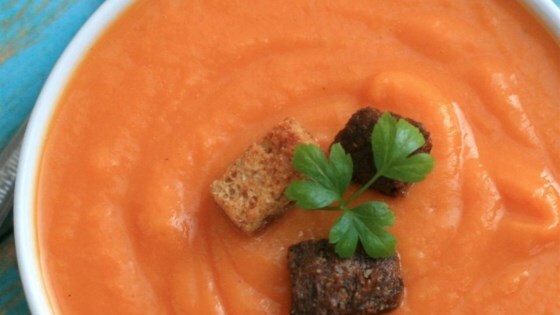 Pour soup into a food processor or blender no more than half full. Cover and hold lid down; pulse a few times before leaving on to blend. Puree in batches until smooth.